Compiled by Dr. Charles Banks, c. 1925. Transcribed and prepared for the web by C. Baer 1999. The derivation of this family name is traced to Glegerne, a Celtic name given to a camp on the border line of Scotland by the Romans A.D. 80 during the invasion of England. From this the name became Cleggerne, Clegherne, Cleghorn, and lastly, Claghorn. The barony of Cleghorne existed in Scotland in the 12th century and a chapel of Clegerne was connected with Dryburgh Abbey. 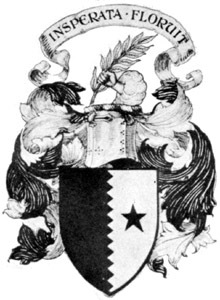 The lands connected with the barony were granted in 1441 to Sir Alan Lockhart of Lanarkshire in whose family the title remains to the present day. Claghorn, as a family name, appears in Scottish records as early as 1350 in Edinburgh, Cramond, Lothian and Corstorphine. In the latter named parish there lived a James Cleghorn who d. 5 June 1588, leaving among others two sons James and Henry, and the latter was father of three sons and one daughter, viz: Thomas, David, James and Isobel. James, the youngest son, with his sister Isobel, was the heir of his older brother, David, in 1647, and is believed to be the James Claghorn who was brought to New England in 1650 as a prisoner of war during the Scottish Rebellion, following the Battle of Dunbar. Corstorphine, the home of the Claghorns, was occupied for a year by the troops of Cromwell and many of its families driven into exile. In the fall of 1651 about 150 of the Scotch prisoners were sent to New England for indenture as "slaves or servants" in the ship "Unity". They were treated as human chattels and classed with Indians and negroes in the social estimate of the Puritans. They were bound out to the wealthy classes as household or agricultural helpers. 1. JAMES CLAGHORN, like all the Scotch prisoners sent to New England, was farmed out and undoubtedly, his time was sold to Bernard Lombart (Lumbert) of Barnstable sometime bef. 1654. He retaliated on his master by taking his dau. ABIAH LOMBARD to wife 6 Jan. 1653-4. He removed into Yarmouth 1662 and there lived during the remainder of his life. He was rated at Yarmouth in 1675 for the expenses of King Philip's War. His wife committed suicide by hanging in Oct. 1677, having been for sometime mentally afflicted. His will 11 Oct. 1683 was pro. 25 Oct. following and he d. bet. those dates. 10. JAMES, b. 29 Jan. 1654; served in King Philip's War 1676 and Expedition to Quebec 1690; d. 27 Mch 1723 at Rochester, Mass. 11. MARY, b. 26 Oct. 1655; m. JOSEPH DAVIS 20 Mch. 1682. 12. ELIZABETH, b. Apr. 1658; living 1683. 13. SARAH, b. 3 Jan 1659-60; living 1683. 14. ROBERT, b. 20 Oct. 1661. 15. SHUBAEL CLAGHORN, (James1) b. abt. 1663; res. Barnstable, yeoman. He m. JANE LOVELL, dau. of John and Jane (Hatch) Lovell of B. who was b. 28 July 1670. His will 5 Sept. 1725 is the proximate time of his death. The inventory of his est. amounted to £877-8-7. His wid. 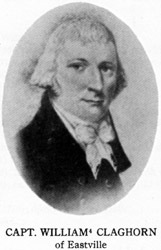 married John Bumpas of Rochester. His descendants are the only ones of this family to take up permanent residence on the Vineyard and for that reason other contemporary branches will be omitted from this genealogy. 40. JAMES, b. Aug. 1689. 41. THANKFUL, b. 1690; d. 6 Jan. 1690. 43. SHUBAEL, b. 20 Sept. 1696. 44. ROBERT, b. 18 July 1699; m. THANKFUL COLEMAN. 45. BENJAMIN, b. 1701; of Newport 1730. 46. THANKFUL, b. (1703); m. EBENEZER SMITH (359). 47. REUBEN, bapt. 28 Apr. 1706; m. ELEANOR LOVELL. 48. MARY, b. 1707; m. EBENEZER CLARKE of Rochester; (int.) 6 Mch. 1729-30. 49. JANE, b. 1709; m. JOSHUA LAMBERT, JR.
50. EBENEZER, b. 30 July 1712; m. (1) SARAH LAMBERT 30 Oct. 1735; (2) ELIZABETH HAMBLIN 8 Sept. 1763. 77. JANE, b. 21 Dec. 1717 [in Edgartown]; m. (l) RICHARD WHELDON ["late of Edgartown"] 8 Dec. 1735 [in Edgartown]; (2) ENOCH COFFIN (35) 27 Dec. 1739. 42. THOMAS CLAGHORN, (Shubael,2 James1), b. 20 Mch. 1692-3, res. E. (Eastville), innholder. He came to E. from Barnstable and bought a lot on the "Line" in 1721, his first recorded appearance. He m. (1) ABIAH SMITH (356) abt. 1721, who was b. June 1699 and d. 10 Feb. 1730 [in Edgartown] [She is buried at Tower Hill Cemetery.] ; m. (2) SUSANNAH GIBBS dau. of Barnabas Gibbs of Sandwich 2 Nov. 1732, who was b. 28 Sept. 1712 and d. Nov. 1786 [in Edgartown, of "pul: fever."] He d. Feb. 1784 [in Edgartown, of old age, called "of Holmes Hole."]. His will 23 Feb. 1774 was pro. 28 Apr. 1785. He had been an innholder for fifty-three years in the old Linton House at Eastville. 86. SUSANNA, b. (1737); m. (l) WILLIAM WAILEY 1 Jan. 1776 [in Edgartown]; (2) JEREMIAH PRIOR 14 Oct. 1788. 87. JANE, b. 10 Mch. 1740, m. (l) GARRISON MEARS [of Gloucester] 21 Aug. 1760 [in Edgartown]; (2) EBENEZER SMITH (431) 9 Oct. 1777. 91. BARNABAS, b. (1748); drowned 9 June 1759. 102. EXPERIENCE, b. (1730); m. ELIHU SHERMAN of Dartmouth. 103. HAWES, b. (1733); rem. to North Carolina. 104. BENJAMIN, b. (1736) rem. to North Carolina. 106. TIMOTHY, b. (1743); rem. to North Carolina. 107. ELIZABETH, b. 1 Aug. 1746 [in Chilmark]; m. perh. ELIHU SHERMAN 28 Oct. 1766. 108. GEORGE, b. 6 July 1748 [in Chilmark]. 109. JAMES, b. 25 June 1751 [in Chilmark]. 80. BENJAMIN CLAGHORN, (Thomas,3 Shubael,2 James1), b. 1722, res, E. pilot. He m. KATHERINE BLACKWELL of Rochester 27 Feb. 1746, who was b. 16 Aug. 1725 and d. 1 Jan. 1804 [in Tisbury. She is buried at Crossways Cemetery.] He was drowned 9 June 1759 with his son Samuel in Vineyard Sound. Adm. of his est. was granted to his wid. 19 July 1759 and inventory of the property amounted to £295-12-2. He was adm. to the church 1741 and was prominent in its affairs. After his death the wid. and children rem. to Rochester, but they returned and d. here. He lived in the present town of Oak Bluffs. 166. SAMUEL, b.10 Mch. 1748; d. 9 June 1759 (drowned with his father). 168. JOSEPH, b. 21 Jan. 1753. 169. HANNAH, b. 21 Jan. 1756; m. (1) BENJAMIN BARTLETT 21 July 1774 [in Edgartown]; (2) ABNER NORTON (472). 171. HANNAH, bapt. 17 July 1756. 174. THOMAS, b. 1765; d. 1783. 175. (Child), b. 1770; d. 1772. 180. ELIZABETH, b. 20 July 1758 [in Dartmouth]; m. (1) _____ POTTER; (2)_____ BABCOCK. [Joe Eddleman <JOEEDDLEMAN@charleston.net> notes that Elizabeth "m. (1) 09/15/1774, in Dartmouth, Mass., Oliver Potter, occupation ship captain, d. at sea. She m. (2) 03/26/1785, in Dartmouth (Church of Christ, 1st. Congr. Chur.of Dar. 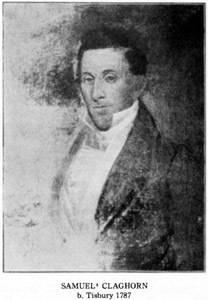 ), Eastland Babcock aka Badcock, b. 05/17/1762, New Bedford, (son of Benjamin Babcock and Virtue Eastland) buried: New Bedford. Elizabeth died 09/23/1849, New Bedford, Mass. Resided with Spooner Babcock in 1843. According to a letter mentioning her death, Elizabeth Claghorn died 200 miles from New Bedford. Oliver: A letter from Mary Crow speculated that Oliver Potter died cir. 1777. Eastland: Living in New Bedford in 1848. 85. MATTHEW CLAGHORN, (Thomas,3 Shubael,2 James1), b. 1735; res. Homes Hole, mariner. He m. JANE BARTLETT 4 Oct. 1759 [in Plymouth], dau. of Joseph and Jane (Swift) Bartlett of Plymouth, who was b. 1741 and d. Apr. 1806 [in Holmes Hole.] He d. bef. 1774. 191. DEBORAH, d. 1825; prob. unm. 90. JOHN CLAGHORN, (Thomas,3 Shubael,2 James1), b. abt. 1746; res. E, mariner. He m. LYDIA WEST (115) 7 Feb. 1770 [in Tisbury], who was b. 29 Aug. 1747 and d. 31 Dec. 1770 [in Tisbury] in childbirth. He d. at sea bef. 10 Jan. 1771 as adm. of his estate was granted to Isaac Daggett and Cornelius Norton on that date. "A whale killed him" as stated on his gravestone. Adm. of his wife's estate was granted to her father, Dr. Elisha West 4 Feb. 1771 and he was made guardian of her infant daughter. 200. LYDIA WEST, b. Dec. 1770; m. THOMAS WHITTRIDGE 9 Oct. 1790. 100. SHUBAEL CLAGHORN, (Shubael,3-2 James1), b. abt. 1725; res. C., mariner. He m. MARTHA HILLMAN (62) 7 Jan. 1748 [in Chilmark], who was b. abt. 1728. He sold his property in C. 1772 and rem. to North Carolina with his brothers (103, 104, 106). He served in the Revolutionary War in various capacities after his removal to that state. 201. JEDIDAH, b. 8 Mch. 1749; m. SETH CLEVELAND (50). 213. BENJAMIN, b. 8 Feb. 1772; d. 23 Feb. 1789. 214. TIMOTHY, b. and d. y. 215. POLLY, m. SAMUEL L. VALENTINE 22 Apr. 1798. 216. DEBORAH, m. (1) ABIEL HATHAWAY; (2) PETER DE LOUIS. 217. GRACE, b. 1782; m. WILLIAM BEEBE 7 Oct. 1802; she d. 1883 aged 101 yrs. 17 days. 218. LYDIA, b. Feb. 1791; d. 16 Aug. 1863; m. JEREMIAH WHEELER. 109. JAMES CLAGHORN, (Shubael,3-2 James1), b. 25 June 1751; res. C. farmer. He m. (1) SALOME COTTLE (166) 17 Feb. 1774 [in Chilmark], who was b. 18 May 1752; d. 14 Oct. 1787; m. (2) MARY WILDE 9 Mch. 1788, dau. of Jesse Wilde of Williamsburg; she was b. 1760 and d. 1796; m. (3) MRS. ASENATE (STRONG) MILLER 8 June 1796. He d. 1 Aug. 1810 and adm. of his estate was granted to his son James 16 Oct. of that year. 220. WILLIAM, b. 13 Nov. 1774; living Somerville, N. Y. 1846. 221. SARAH, b. 12 Oct. 1776; m. EPHRAIM GREEN. 222. EXPERIENCE, b. 19 Apr. 1778; m. ELISHA NASH 25 Nov. 1799. 223. LYDIA, b. 11 Feb. 1780; m. WILLIAM PORTER of Palmyra, N. Y. 224. ORINDA, b. 20 Oct. 1781. 225. BETSEY, b. 8 Apr. 1784; m. JOSEPH BEAL. 226. MARTHA, b. 28 Aug. 1786; d. Cummington, Mass. May 1845. 227. JAMES, b. 24 Jan. 1789; res. North Evans, Erie Co., N. Y. 228. MARY, b. 8 Aug. 1790; d. 1792. 229. GEORGE, b. 14 June 1792; res. Masonville, N. Y. 230. AHAZ, b. 14 Feb. 1794; d. Aug. 1822. 231. BENJAMIN, b. 1 Feb. 1796; res. Williamsburg, Mass. 232. MARY WILDE, b. 9 Mch 1797. 233. TEMPERANCE, b. 7 Nov. 1798. 234. JUDAH, b. 24 June 1800 ; res. North Ridgeway, Ohio. 235. ELMIRA, b. 23 Dec. 1802. 236. JAMES MILLER, b. 16 Aug. 1804; d. 1899 Buffalo, N. Y. 168. JOSEPH CLAGHORN, (Benjamin,4 Thomas,3 Shubael,2 James1), b. 21 Jan. 1753. Res. T., housewright. He m. ANNA MENDALL 30 Apr. 1786, who was b. 14 May 1755. He was a school teacher in Homes Hole. He d. 19 Oct. 1805 [in Tisbury, "of E. Parish",] and his will 2 Oct. 1805 was pro. 5 Nov. 1805. 250. 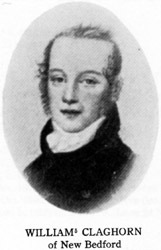 JOHN WILLIAM, b. 24 Aug. 1789. 261. THOMAS, b. 1797; d. 1817. 262. SARAH NORTON, d. 9 Apr. 1805. [250. JOHN WILLIAM CLAGHORN, (William,5 William,4 Thomas,3 Shubael,2 James1), b. 08/24/1789, Rochester, Mass. Living in Philadelphia in 1848. Are you descended from this family? Do you have additional information that should be added to this page? Questions? Queries? Looking for an CLAGHORN? Post your Martha's Vineyard CLAGHORN Family questions to the Dukes County Genweb Query Forum. Or, use the Cleghorn Genforum for any and all Claghorn/Cleghorn Family questions.